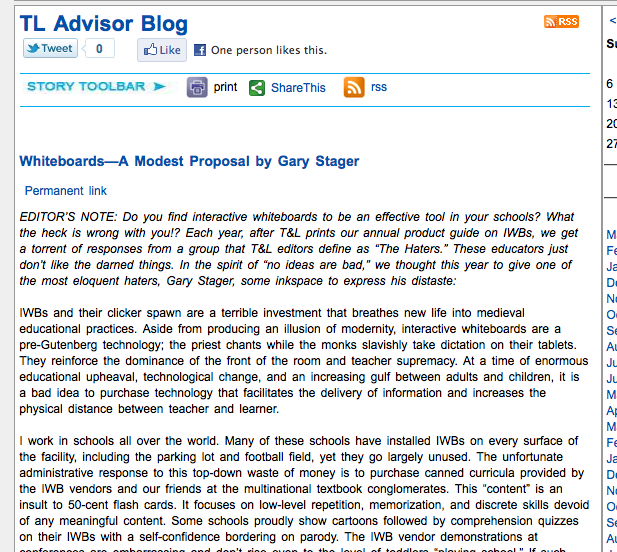 One night recently Gary Stager sent me a link to a blog post he'd written at Tech&Learning. "Want to join in?" he asked, knowing - I assume - that I sure would.Now Gary and I are hardly joined at any hip on education issues, we can clash as often as we agree, but (a) we're both serious Jets fans, and (b) what Gary was doing here, diving into the heart of the "sell tech to educators industry" and challenging their assumptions, needed and deserved support. 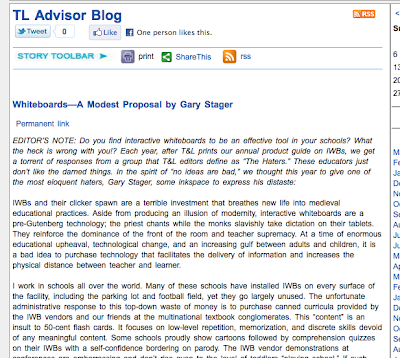 Specifically their assumptions regarding the value of branded Interactive White Board (IWB) systems , which cost schools about $5500 (US) apiece. After writing my first response I went back to a current night-time ritual: working through the episodes of the 1951-1952 "live" TV science fiction series Tales of Tomorrow on Hulu. And this episode appeared, and episode focused on a retired professor who builds himself a "reading robot." The robot uses scanner eyes, converts those images of the pages into digital text, and reads on the simple command, "Read to me, Herr Doktor." And the debate at Tech&Learning merged with the start of this Frankenstein story as I watched. There is an imagination deficit in our tech planning in education. A serious imagination deficit. And that deficit costs us to buy foolishly and throw money away. No, I'm not talking about all the schools which bought iPad v.1 - because you needed just a smidgeon of historical knowledge, not imagination, to know that you never buy Apple's initial release of anything. But maybe in a way I am, because the failure of imagination is based replicating ("scaling up") things we see around us right now (or five years ago) and not imagining what will be possible before our kindergartners get out of primary school. And so like The Simpsons episode where the answer to the question "Where can we show something like this?" (A 16mm film), is, of course, "The School!" We continue to build museums of technology. In the debate on Gary's blog, Alan November says this, "Professor Mazur spent 3 years developing his questions for his physics class that he uses with the clickers," and Chris Betcher says this, "I wouldn't buy a $1000 projector for a room for the same reason I wouldn't buy a $500 netpad as my main computer." And in both cases they are discussing the need to project five years ahead in thinking. But the problem is, their five years ahead seems to assume that nothing will change. I don't want to buy a (non-auditorium) projector I have to amortize over five years for the same reason I don't want to buy a mobile phone I need five years to pay for - I won't want it in three years. It will be ancient, inefficient, limited technology in three years. I will know that in two years. So, as I look around at tablets and nano-projectors, at true touchscreens and multitouch, at the rapid 'de-centering' of learning, perhaps the best way to get interactive white boards now is by buying a Wii for each classroom and using it for IWB-like purposes when kids are not playing (note date). Lowest investment, best multiple purposes. Or, if not that, I'll hook my TabletPC up to any projector and I have a cheap, pass-around-the-room IWB. But either way I won't be bolting a $5500 piece of equipment to a teaching wall... because I don't want to reinforce the teaching wall. What I want is for kids to interact cooperatively with information in ways which better "fit" them and which offer better acess for kids on this margins. That's where I start when I think about things which might lead me toward purchasing touchscreen technologies of any kind. But we often tend to miss the first question regarding purchasing Information and Communication Technology for schools. "What do we want to do?" With that question in mind, we can start letting our imaginations mix with research. 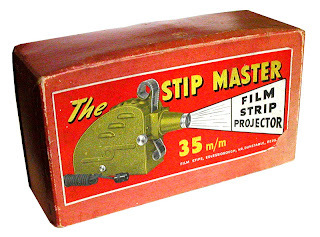 The first time I held a nano-projector in my hand two years ago, I immediately imagined a classroom where we passed four or five of these around to link to students' mobiles. And I probably decided that IWB purchases would now become rare in my mind. Not because I could go out and buy a ton of those two years ago, but because I knew what was coming. So where might that lead my tech purchasing? Toward cheaper IWB-like solutions now, and toward the WiFi and phone system and AC/Electrical technologies to support schools full of individual - and probably very different - mobile devices. Likewise, if I want kids working and researching in the global cloud, I might not be buying top-of-the-line MacBook Pros or very expensive PC Laptops, but cheaper short term solutions of various kinds so that we might (a) judge student use and response, and (b) put some real cash into widening our data pipelines. But no matter what the "What do we want to do?" question is, we should really leave anything beyond three years a set of hazy considerations. Question, dream, imagine, consider the education you want to offer. Then look, research, question. Then buy what works now in a way which allows you to respond to the future you know is coming. Key question isn't, "Should we buy iPads?" As you point out, it should be, "What do we wantvto do?" I'd add to that, "What do we want to create?" Ira I was glad to see you looking at this from a "smart spending" perspective. At the lowest end (which are the things schools tend to spend the most on), laptops can do the job of any textbook or IWB. But they can do so much more - and the best part about them is that the STUDENTS are the ones using them. Laptops have withstood that test of time that you point out here. Unfortunately I think the laptop story is old and people don't want to listen to it anymore, especially when IWB's look modern and give any classroom that "hi-tech" cache' that people like to see. But I totally agree that they are a fad. I remember thinking exactly the same thing about laser-disk players. As you have said here, so many schools now also seem to want to purchase iPads and other mobile devices. I wonder how that will shake out in 2 to 3 years? I like them, but it seems to me there is a great loss of computing power by using them as a replacement for, instead of a supplement to, laptops. What do you think? They definitely have a much lower cost, but will they satisfy (students, teachers, admin, parents) in terms of learning potential? I have been dealing with this question in my own building with regards to future purchases. Sure, I'd like my students to have some iPads, but not if it means giving up laptops. Do you think I am being too old school in my thinking on this? We've been told for awhile now that we need to re-think teaching, but will these mobile devices make me re-think computing? Of course there are the consumer issues to take into account, but fundamentally I think this debate comes down to the issue of stance. Papert's choice between instructionism and constructionism works best for ME. Personally, I find the IWBs to be a solution in search of a problem - one that paradoxically creates new problems. I think lots of younger students would actually prefer an iPod Touch or an Android competitor if it ever arrives. They cost at least 1/2 as much as an iPad, and from the student's point of view, the ability to slip them in a pocket is huge. The biggest problem I have with the iPod Touches is that they don't run Firefox well, if at all, which limits them with applications like Moodle. Moodle needs Firefox? That sounds like a limitation of Moodle. And, uh... Whatever happened to One Laptop Per Child? Have there been any studies on the results of that project? As usuall you have challenged my perspective and stretched my thinking. My school is not a 1:1 school, but I try to keep as many computers available for students as I can by conscientiously maintaining the ones we over many years. A couple of times I have opted for cheaper devices, thinking they'd be good enough for as long as they are needed, but for most part I have been disappointed. While it is true that full size, full power laptops have more features than the students need, they have also been easier to use and maintain, have required less maintenance and have last longer than the less expensive devices have. In my mind spending more money upfront has provided a better return for students. And yes, we have Promethean ActivBoards in our classrooms, all purchased within the last two years. Most of teachers wanted interactive whiteboards and after a lot of research we chose the higher end option because of the "package" that came with it. The Promethean boards have been easy to use and maintain. The support has been great. The software is free to anyone (students and families, as well) who wants it, as are the promethean planet training and teaching resources. Are there cheaper options? Yes, but we believed in the long run we were making the more fiscally and educationally responsible choice. As I walk through my building I see teachers teaching in places all over their classrooms, in the commons areas, the media center, even the halls. They are not tied to their boards and the students' eyes are not glued to the wall. The boards are there to be used when need and opportunity collide. Sometimes they are used for students to discuss and enter feedback on a teacher message. Sometimes they are there as a center for students to play learning games (more can partipate at one time than at the classroom computer.) Sometimes they are there for teachers to stream content from the Internet such as YouTube videos. All of these would be more difficult and likely less interactive with just a computer and projector. Further, teachers who were afraid to connect their computers to a projector and speaker, are entirely comfortable connecting to their ActivBoards. This means students in classrooms where before there was no chance of using technology now have ready access. It means teachers who were overwhelmed by the thought of firing up 24 laptops with their primary students can now do the same online activities with their students on their boards. My hope for this next year as teachers become more comfortable using technology as a whole (some began at level zero,) at least some will feel confident enough to begin to look for ways to connect their classrooms to others outside of our school. So I guess my point is that when money is tight, schools don't have to take the cheap route if they choose tools that will help teachers accomplish their goals in the long term. We're going to have our Activboards for a long time. I believe the investment was a good one because our teachers are excellent teachers and will learn use them to use them not exclusively, but effectively. Thanks for all you do to keep the discussion out there. Why is China the model rather than Finland?